Western Digital today announced it has doubled the capacity of its line of iOS mobile flash drives with the introduction of the256GB SanDisk iXpand Flash Drive and 256GB SanDisk Connect Wireless Stick. The new thumb drives now match the top-capacity offered in iPhones and iPads and retail for $280 ($199 Amazon price). The new iXpand Flash Drive can automatically back up an iPhone or iPad camera roll and lets users watch popular video formats (WMV, AVI, MKV, MP4, MOV) straight from the drive. The drive has both a flexible Lightning connector that works with most cases and a USB 3.0 connector to plug into a newer Mac laptop or a PC. The iXpand Flash Drive also includes encryption software that allows users to password-protect files, so content can be shared while more sensitive files are kept secure across devices. As part of the device update, users can now cast content from the SanDisk iXpand Flash Drive to their television via Chromecast or Amazon Fire directly from the iXpand app. The app is available for download from the App Store for iPhone and iPad, and launches when the SanDisk iXpand Flash Drive is plugged into one of those devices -- allowing for access to the user's content and easy file management. 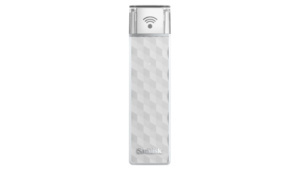 The SanDisk Wireless Connect Stick wirelessly streams data via Wi-Fi (802.11 b/g/n); no Internet connection or router is required. The Connect Wireless Flash Drive also has a slide-out USB 2.0 connector that works like any thumb drive. The SanDisk Connect Wireless Stick can stream music, videos or HD movies to three devices at a time via the SanDisk Connect app and is designed to make it easy to share and stream content between multiple devices and computers. The Connect app also supports streaming on large displays via AirPlay with Apple TV. "Consumers enjoy using the latest advanced mobile devices to capture high-resolution photos or to record 4K videos. With such advancements, device storage capacities are increasing, and we believe consumers will continue to demand separate high-capacity devices and storage solutions to help them manage their digital life," Neil Shah, research director at Counterpoint Research, said in a statement.